When you talk to professional hockey athletes, one common theme that you will see among them is that they will not only discuss the importance of their physical training – but they always talk about their mental approach to their training and on game days as well. Intuitively, they know it makes a major difference for them. They know that the mind is in control of the body, and not the other way around. Too many people separate mind from body, especially when it comes to something that seems so “body-focused” such as your strength and conditioning program. But today, I want to talk about a study that was recently done that helps demonstrate the effectiveness of all the mental training I have been recommending hockey athletes do for years. I have created many videos, blogs, podcasts, and have even done full in-person lectures on sports psychology and the experience I have working with athletes in this regard. Many high-level athletes and high-level coaches have known and practiced mental preparation for sports performance for years, and this study set out to test the degree to which mental training could actually impact physical performance. In this 12-Week controlled trial, all test subjects followed the exact same strength training protocol – but, one group also performed additional mental training in the form of visualization and positive self-talk throughout the process whereas the other group only did the strength training. While both groups ended up getting stronger in the bench press and half-squat (squatting to parallel), the group that did the additional mental training experienced larger strength gains, a decrease in heart rate, a decrease in blood pressure, and an increase in their testosterone to cortisol ratio. What does this mean for hockey players? Well, based on the results of this trial we can suggest that mental training allows you to make faster physical progress while not creating any deeper recovery demands. 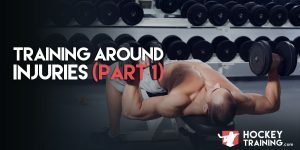 This is powerful stuff, because normally if you want to make faster progress – you’re going to need to ante-up your recovery strategies as well. But what we see here is that if you train the mind, the body will follow suit in a controlled manner which predicts much better and much safer long-term gains in physical performance. The standalone fact that we can see here that adding mental training to your regime can improve the rate at which you make progress without making it more difficult to recover from your training is already more than reason enough to start utilizing it in your everyday training routines – let alone the impact it can have on your confidence out on the ice. What’s astonishing here is that if you take the hormonal data reported in this study at face value it suggests that the mental training group was actually is a more recovered state post-workout even though they were making better gains in the gym. As a coach, I can tell you that’s nothing short of amazing. Because I know you’re going to ask, the mental training group performed both visualization and positive self-talk. 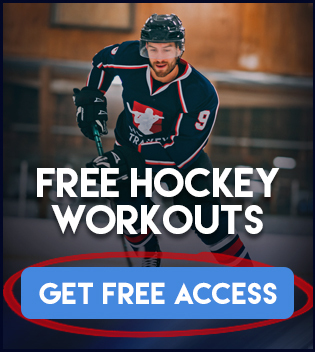 I already have plenty of available information for hockey players on these two topics for you to check out as I’ve been harping on these techniques for years – now I just have the data to back it up. One thing you can implement right away is positive self-talk and visualization in between your sets at the gym – that’s exactly what this test group did in order to get the results that they got. Do you want to know what they didn’t do between sets? Goof around with their teammates or check their Instagram. Stop doing this alone will result in better progress – I can guarantee you that. Because this isn’t the first time we have seen mental training make people stronger – we saw in this study here with a very similar layout that the mental training group received much more progress in terms of strength development than the non-mental training group. The mental training aspect of hockey is just as important as the physical training aspect. You can’t have one without the other if you want to be your absolute best. One thing I want to mention before I close this out is that when performing visualization exercises, the most effective form within the research is the kind where you picture yourself doing the act in first-person – as if you’re looking through the eyes of the person (yourself) doing the task. Beyond this, the more details you can create in your mind, the better. If you’re training, think about the bar digging into your hands, how the chalk feels when you’re getting ready, the feeling of your muscles stretching and straining against the weight of the load, how the pump feels after a set, what it feels like when you lock your hips out at the top of a deadlift, etc. Same thing as before a game – what does your skate feel like on your feet, how does that feel when cutting the ice, what’s your first-person view in your position on the ice, how does the puck feel on your stick as you skate up the ice to get by the D-men, etc. Details matter, the more effective your mental imagery training is – the greater of an effect it will have on your physical performance. In the end, adding mental training can help you both get better and recover faster at the same time – as well as decrease markers for physiological stress (cortisol, heart rate, blood pressure). Of course, mental training doesn’t replace practice, games, good nutrition, good sleep, and a well-designed hockey training program – but it sure as hell adds a major bonus.